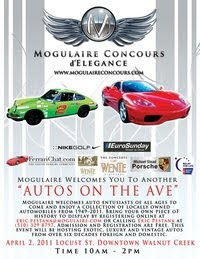 In the first of a couple of "preview" events leading up to the main event in July, Mogulaire Concours d'Elegance is sponsoring "Autos on the Ave" on April 2. This display of exceptional automobiles will be happening from 10 am until 2 pm on Locust Street in Walnut Creek. Complete information can be found at both the website and facebook page for Mogulaire Concours d'Elegance. I'm thrilled to have been asked to provide music for this event! The next preview will be held at the Blackhawk Auto Museum in Danville on May 28, and the larger, final show will be held at Wente Vineyards in Livermore on July 23. Here's hoping for good weather on April 2 - and I also hope you can come out and meet me! Another chance to meet your DJ!